On 24 October 2016, Bracell Limited, a global leader in the specialty cellulose industry, announced that the US$1.1 billion privatisation by BHL Limited has been completed and its main board listing (stock code: 1768) on The Stock Exchange of Hong Kong will be withdrawn after market close today. Over the last three years, the Company has delivered total shareholder returns of 273%. Bracell will be part of the Royal Golden Eagle (RGE) group, which manages world-class companies operating in pulp and paper, palm oil, viscose staple fiber and energy, with combined assets exceeding US$15 billion and more than 50,000 employees. At the time of Bracell’s listing in Hong Kong in 2010, its business consisted of dissolving wood pulp and viscose staple fiber. In December 2014, Bracell disposed of its viscose staple fiber business in China and distributed the proceeds through a special dividend of US$618 million. Starting 2015, Bracell focused solely on its Brazilian dissolving wood pulp operations, turning into a leading global pure-play specialty cellulose producer. Bracell has since achieved record production and sales of specialty-grade dissolving wood pulp. “Shareholder confidence in Bracell enabled us to grow bigger and stronger over the years, riding out tough times as well as taking advantage of opportunities to deliver value for all,” Ying said. Bracell has won numerous accolades, including The Excellence of Listed Enterprise Awards for five consecutive years from Capital Weekly, as well as the Best Environmental Responsibility Company and Asia’s Outstanding Company on Corporate Governance from Corporate Governance Asia. Anyone who is familiar with the RGE Business Group and Tanoto Foundation will know that they are under the leadership of renowned pioneer and visionary, Mr Sukanto Tanoto. The companies that form part of the business group and foundation are also involved in the forestry and paper manufacturing industry in Indonesia. The aim of the Tanoto Foundation is to encourage more students to go into the paper manufacturing field, to help boost the Indonesian economy. With that in mind and together with RAPP (Riau Andalan Pulp & Paper), students from 6 prominent schools in Indonesia were invited to visit the RAPP factory to learn and see first-hand how acacia wood is transformed into fabric fibres and pulp. Students who attended the field-trip were impressed by the RAPP factory which already offers jobs to many residents of the area. Mr Sukanto Tanoto was applauded for his 4Cs approach, which focuses on doing good for community, the country, the environment and the company. This particular visit to the RAPP factory was a great way to show students just how Mr Tanoto’s business theories and practices really work. Zamzuli Hidayat who hosted the visit to the RAPP facility, told media that the students were great achievers and were only slowed down by a lack of funding for their education. It is the hope of the Tanoto Foundation and RGE Business Group to help students, who have an interest in paper manufacturing and an eagerness to learn, by providing them with scholarships and improved education. Many of the students who participated in the visit to the RAPP factory were stirred by the fact that Mr Tanoto could build such a successful empire despite all the challenges he has faced himself. Many aim to be a part of the Tanoto Foundation or RGE Business Group in their future. What sets the RGE Business Group and Tanoto Foundation apart from other large companies operating in Indonesia is their interest and dedication to other areas, beyond profits. Mr Sukanto Tanoto has a 3-bottom line philosophy which has earned his businesses success and respect over the years. The 3-bottom line approach is one that focuses on profits, absolutely, but it also addresses the need to help the community and care for the environment too! The RAPP factory visit, which took place on the 13th of October is just one of many efforts that the group of companies makes to improve on education and the quality of life for locals in Indonesia. In recent news, the Corner Network (a prominent Indonesian news portal) sung the praises of the Tanoto Foundation which is headed up by none other than powerful and respected businessman, Mr Sukanto Tanoto. Muhammad Nasir who is the minister of research, technology and higher education gave his thanks to the Tanoto Foundation and various other organisations who recently made scholarships available to hundreds of Indonesian children. While all of the RGE companies, the Tanoto Foundation included, already operate according to the philosophy of making a difference, it was encouraging to hear Nasir himself say that human resources and education in Indonesia are not only the responsibility of the government, but should become a priority for organisations that have the means to make a difference. Nasir also made mention of the fact that it is contributions such as the Tanoto Foundations’ that supports the Indonesian government’s limited budget, while also helping to positively change the quality of lives of local community members. Muhammad Nasir appealed to other corporates to take a look at how the Tanoto Foundation has contributed to education in Indonesia and appealed to them to try to follow suit. The Tanoto Foundation forms part of the Royal Golden Eagle Group which was founded by Mr Sukanto Tanoto. The group of companies, which is largely involved in forestry, is dedicated to being profitable while still having a positive impact on the environment and the surrounding community. As such, the provision of scholarships for children is not all that is done by RGE and its subsidiaries. In fact, the group is involved in many social and economic responsibility projects and makes itself available to those seeking out assistance with community development efforts. Changing the lives of Indonesian locals might be only one of the group’s focuses, but the way they handle it, you would think it’s a top priority! Hats off to Tanoto Foundation and the Royal Golden Eagle Group! Indonesia’s education system and government couldn’t do it without you! Founded in 1973 by Sukanto Tanoto , RGE (Royal Golden Eagle) is a global group of independent manufacturing companies across various business sectors, employing 50 000 people worldwide, with assets estimated at exceeding US$ 15 million. Their core focus lies in pulp and paper and energy resource development, although the various groups in the RGE company manufacture and distribute a diversified range of products. Each group within RGE operates independently and has its own holding company, which is overseen by an independent board of directors. A common denominator to all these groups is that they are all driven to practise sustainable developments and achieve energy and production efficiency in an environmentally friendly way. Although RGE promotes responsible forestry management which includes the protection of High Conservation Value Forests (HCVF) and low impact harvesting techniques, the APRIL group has had a lot of trouble in the past with environmental activists due to deforestation of Indonesian peatlands. In May 2013 APRIL announced that it would be sponsoring US$ 17 million to the RER (Restorasi Ekosistem Riau ) programme over the course of the next 10 years to help restore and preserve the important peat forests on the Kampar Peninsula. 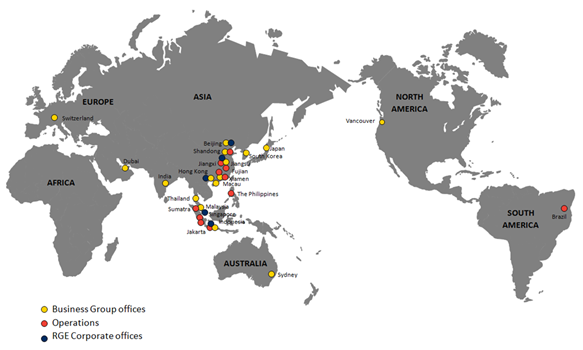 RGE has manufacturing operations in Brazil, China and Indonesia, corporate offices in Singapore, Jakarta, Beijing and Nanjing, as well as sales offices world-wide, which you can view on the map below.